This new listing is located in West Rogers in the Creekwood subdivision. The area is known for drawing young families as the schools are great (currently ties up to Janie Darr Elementary, Elmwood Junior High, and Rogers High School. The surrounding area has walking trails & a community pool. What you'll find when driving around is young children out and about playing. It's a "get to know your neighbors" kind of vibe. This home I'm going to tell you about is the latest listing for sale in the neighborhood. At 4214 Willowbend Dr in Rogers, Arkansas this 5 bedroom 2.5 bath home was built in 2008 & is 3401 sq ft, listed for $385,000. It's got cute curb appeal with a covered front porch where you can sit and watch your kids play on the nice flat driveway or meet your neighbors walking by. Through the front door you'll see a formal dining room on the right. It's an open concept plan so the living room flows into the kitchen so you can visit with guests while entertaining easily. Beautiful engineered wood flooring in the living room and hallways on main floor. The sellers have recently painted the main floor with grey tones which is very trendy right now. The kitchen has a good sized bartop island with granite countertops all throughout. The microwave & oven is built into the white cabinetry. It features a gas stovetop and vent hood as well as a pantry. All the kitchen appliances are stainless steel too. Another added detail is the undercabinet lighting adding a bit of flare to the kitchen, and a central vaccuum system to help with easy cleaning of the floors. Around the corner you'll find the master suite on the main floor. The master bedroom has a trey ceiling with crown molding detail. The master bathroom has dual sinks, a jetted tub, a private commode, walk-in tiled shower, and a walk-in closet as well. Upstairs has so much to offer a buyer. To the right up the stairs is a large media room where all sound equipment, screen, speakers, projector, & lounge chairs will convey. Just bring your movies and you are set to go for some movie marathons! What an added perk to a lucky buyer! You will also find 4 bedrooms all with walk-in closets. One of the bedrooms is quite large and can be multi-functional as a second living space upstairs or an office. It can fit more than one bed in it and the walk-in closet is quite large as well. These rooms all share a full bathroom with dual sinks. Outside you'll find a covered back patio and a full privacy fenced backyard with gorgeous landscaping. The sellers are leaving a storage shed too for the buyer. Another note to mention here is that the lot is completely flat. That means the kids can play in the driveway, BONUS! Additional features: this home has a 3 car garage and an above ground tornado shelter (will convey to buyer). 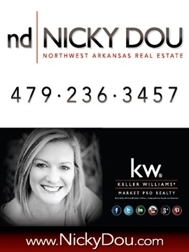 This home has so much to offer and is a must see property in NWA right now. If you are interested in more information about this home please check out my website at www.NWARHomes.com. To take the 3D tour of the property from the comfort of your own home please click here. If you would like to have your home featured here, or you need assistance from a REALTOR® to find a home in Northwest Arkansas give us a call. Don't forget to follow our Facebook page @JennyMillerRealtor. Hi Nicky, Thanks for sharing your new listing of this great home. There are many desirable amenities that will attract prospective buyers. With your dedication and hard work you will have this sold soon.